Millie is Associate Vice President for EDF’s Office of the Chief Scientist. 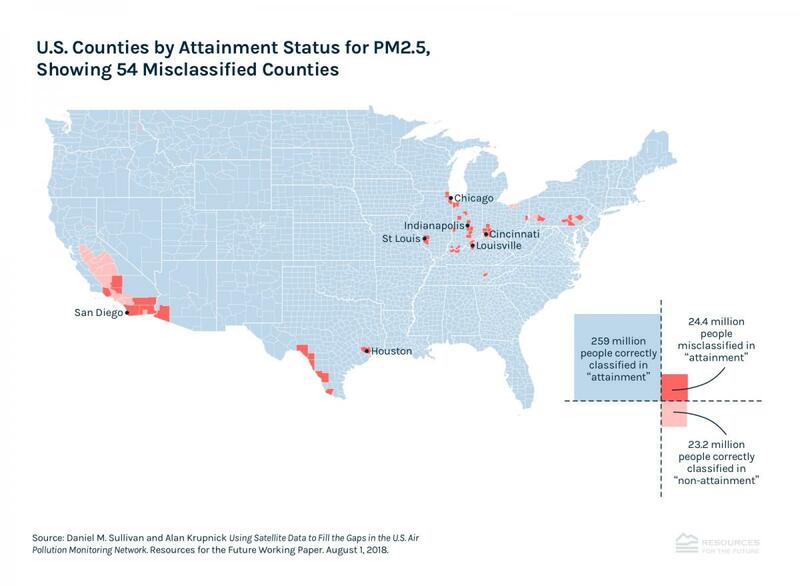 Most counties in the United States have just one – if any – air pollution monitor to help determine if their air is healthy to breathe. Because of the high cost associated with such monitoring, the Environmental Protection Agency relies on data from this limited network along with sophisticated modeling to understand the risks people face in their neighborhoods – with millions possibly falling through the cracks as a result. Researchers at Resources for the Future used satellite data to measure fine particulate matter concentrations, finding that 24 million more Americans than previously thought live in misclassified areas that don’t meet federal air quality standards. Beyond the eye-popping conclusions, RFF’s study demonstrates why new technology is needed to fill the gaps in data. One of the biggest opportunities here are nimble and increasingly affordable sensors that can transform how we measure and track pollution. The researchers at RFF compared satellite data on ground-level particulate matter, or PM2.5, with areas the EPA had designated as out of compliance with the National Ambient Air Quality Standards. They found misclassified areas that had no monitors, or monitors that were too far apart to detect pollution. Others yet had monitors on the edge of hot spots, which means they missed peak concentrations. These are all shortcomings that a new generation of sensors can – and are beginning to – address. As air pollution sensors continue to improve, they’re also becoming cheaper as the market for such technology expands. It makes it possible for communities and researchers to create low-cost networks that monitor for a range of pollutants in areas that currently lack sufficient coverage. Today, the advent of smaller mobile sensors is allowing us and others to attach instruments to Google Street View cars and even city fleet vehicles to see just how much air quality is changing block to block. Our recent study in Oakland showed that air pollution can be as much as eight times higher on one end of the block than the other, which can dramatically affect the health of residents. In that city, people are already using the data from our study to push for emission reductions under AB 617, California’s new air quality law that seeks to reduce pollution in the state’s most affected neighborhoods. Coupled with other emerging sources of pollution data – such as satellites, which the RFF researchers acknowledged have their own limitations – sensors can bring a clearer picture of those 54 misclassified counties. Technology advances like this can empower neighborhoods, improve public health and open doors for innovators eager to explore new opportunities to shape our future. It can begin fill those huge data gaps the RFF study revealed, starting today. For fast ways to reduce air pollution everywhere see aesopinstitute.org MOVING BEYOND OIL on that site will be of special interest as it is about replacing gas, diesel & jet fuel with water, fresh or salt! And the water can come from the air, ending and need to refuel! This past June I almost died due to breating problems. For almost two years, I had been batteling severe allergies, and was told by Dr’s that it was something in my environment causing my distress. It got so bad, the first week of June I developed a strider in my upper airways that cut off my ability to breath. I had to call 911 when I began wheezing and was transported to St Vincent Hospital in Indianapolis where I was admitted to ICU where I spent three days after they saved my life, breaking up the blockage with an epi inhaler. I was hospitalized for a total of six days. This is such a long story it is too long to write in this space. What I will say is that when I got home and able to look for clues as to what may have triggered my episode, I noticed a what looked like dirt on my kitchen window sill. When I wiped it with a paper towel, there was a very black soot like substance on the towel. I even took it to my allergist at my appointment to show him. I believe it was sucked in from outdoors while I had been running my attic fan and had my windows open. I have seen posts on Next Door from folks in my area, complaining of unusual odors in our area. I believe the air that I am breathing has contributed to this health episode. I am disgusted by lack of response from elected officials on environment in Indiana!